This seems to be for tours in classic or vintage cars but as there is a photograph of a "normal" car at the top, I suspect you can book on the tours with an ordinary car as well. There is also an opportunity for classic car clubs to book some of the tours. Even if you are not planning on going on a car touring holiday, there is loads of interesting information about the local areas on the website. 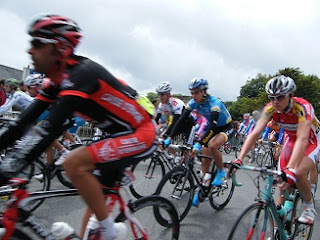 Here is a nice video of the route of the Tour de France for 2011. It starts at Ile de Noirmoutier then through Vendee and into Brittany so there is lots of action for us campers who like to camp in the North of France. We should be able to get to see this great spectacle of a race. Why not plan your campsite this year so you can have a day watching the Tour de France ! We did this two years ago and thoroughly enjoyed the great carnival atmosphere surrounding it all. There is a parade beforehand -"the Caravane" which travels an hour ahead of the Tour and throws out various goodies to the crowds. All good fun. We nearly missed the actual cycltists in the end as they went whizzing past ! The tour this year starts in the Vendee on the Ile de Noirmoutier ! The cyclists will travel over the narrow causeway which should be a great spectacle. So why not camp this year in the Vendee or find out the route of the rest of the Tour ! Ryanair are to leave their base at Marseilles, according to France-Soir News. I dont know if this might affect the number of flights to regional airports in France but it seems to me that it may do. The low-cost airline said on Wednesday that the closure in January of its unique French base in Marseille, is in response to his indictment for "concealed employment". At a press conference on Wednesday at the airport of Marignane (Bouches-du-Rhone), the CEO of Ryanair, Michael O'Leary, has criticized "the decision of French authorities to prosecute against the Ryanair base in Marseilles, which fully complies with the regulations of the European Union for mobile workers transport". In fact, Ryanair will close its only base in France in January 2011. "It's a very dark day but we can not wait a year or more to risk any more significant fines if the court proceedings were not favorable," said Michael O'Leary. Ryanair has been indicted by prosecutors in late September in Aix-en-Provence for "clandestine work" following the complaint of several personal unions. The company, based in Marseille from October 2006, challenged the decree of November 21 of that year subjecting flight crews of foreign companies operating in France to French law. Its approximately 200 employees are subject to regulation by the Irish labor. As of 11 January 2011, four planes of the company and its employees based in Marseille will be transferred to other European airports, perhaps in Kaunas, Lithuania, Barcelona, Bari, Brindisi and Milan. According to its CEO, Ryanair "loses nothing in this operation, but Marseille loses tourists, visitors and jobs." A view shared by the Chamber of Commerce and Industry Marseille Provence which manages the airport. "This departure is very bad news for companies and businesses" and "constitutes a setback for the development" of the territory, responded President Jacques Pfister. For the Marseille Provence airport, where Ryanair is the second carrier behind Air France, with 1.7 million passengers expected in 2010, closing 13 of its 23 lines could lose one million passengers a year. The mayor (UMP) of Marseille, Jean-Claude Gaudin attributes the departure of the company to the "irresponsible behavior of unions." London to Paris Cycle Route ! If you are feeling energetic you might like to try this London to Paris Cycle Route ! However you better read this article first ! Excellent Haynes Manuals about Caravans and Motorhomes ! I just had a look at these excellent Haynes Manuals. Everything you need to know about looking after and running a caravan or motor home. This blog is for everyone who loves camping in France. Our website is at http://www.bestfrenchcampsites.com We have affiliate marketing links on our site - if you click on these, we may earn a small amount of money from the site. We use this to maintain our site with up to date information about Campsites in France ! Blogging here about French Fun, Culture and Camping !